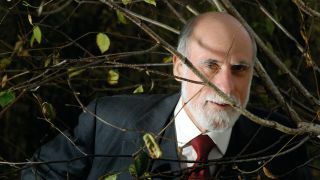 Aptly termed one of the founding fathers of the internet, Vint Cerf certainly acts the part. Now a youthful 70, Cerf remains a bundle of enthusiasm - handling the press with a smile and launching into interviews with gusto. He's a London resident for a few months and has made the journey south of the river Thames to be the main speaker at the O2 Campus Party in the giant tent formerly known as the Millennium Dome. Cerf is one of the creators of the internet. Along with Bob Kahn he created the TCP/IP protocol that underpins the web, he helped form ICANN - the non-profit body that oversees the internet's unique identifiers and ensures that it doesn't grind to a halt - and he worked on ARPANet, the U.S. Department of Defense's precursor to the internet. Now, Cerf works for Google as VP and Chief Internet Evangelist, a role which is perfectly suited to a man who can switch between passionate appeals for ISPs to adopt the IvP6 protocol and anecdotes about how the internet of things can help him gift bottles of wine from his cellar that have not been kept at the correct temperature. king at Campus Party Europe - an ambitious week-long technology festival staged by Telefonica at The O2, London. The unique, 24 hour a day event aims to excite thousands of young people across Europe about the possibilities of new and emerging technologies. The internet has been getting a bit of bad press lately, with governments' Prism reach into our everyday online lives still a major controversy. But, as you might expect from someone considered for the Chief Technology Officer of Barack Obama's tenure as president, Cerf is less polarised in his views. "When the internet became available, we got all of the general public including some unsavoury characters that didn't have your best interests at heart, so we got a lot of bad things showing up on the net in addition to the overwhelming positive value that is available," he told TechRadar. "Small numbers of people are now having enormous impact on a national scale. So the problem here is that historically if we had a national attack going on it was fairly visible because you could see movement of troops and so on. "But, in the 1970s we started to see a very different trend and now its even worse because we have small groups of people who have access to the internet who are capable of doing a number of bad things. "So there's a lot of worry about how to cope with that and the important problem is that security isn't reacting after a bad thing has happened, security is preventing the bad thing from happening. "If it can come from anywhere, if it can come through the internet, and if it can come from small groups of people who are essentially invisible until they do bad things then the question is how do you respond? "[By and large] we elect governments who will look after us and we even give up a degree of privacy in order to be protected. This is not an apologia for what the NSA is reportedly doing, but it's a motivation for understanding why you would want to watch as much as you can in order to detect some of these attacks before they happen." Cerf accepts that the level of surveillance is "unsettling" for the general public: "It's possible to go overboard and in the current situation and the general public in both the US and other parts of the world were not fully aware of this kind of surveillance and in some ways that's part of the problem." Interestingly, Cerf feels that the British response to the Prism revelations was lessened by the 7-7 attacks and how surveillance played a part in the capture of some of those responsible.